STOUGHTON, Mass. – Coming into Monday’s trip to Stoughton, Foxboro coach Lisa Downs knew that her team was in a for a physical test. The Warriors were shorthanded (missing three players to injuries) and lacked the size of the Black Knights front line, but Downs urged her players to meet the challenge. Holding a three-point lead early in the second quarter, the Warriors turned the game into a track meet and put together a 14-3 run to break the game wide open. Behind a near triple-double of 19 points, nine rebounds, and six assists by Ashley Sampson, the Warriors met the physical test and rolled to a 66-38 victory. It did not start well for the Warriors, as Stoughton imposed its style of play on the game and controlled the glass. Bridgette Whalen scored four of her team-high eight points in the first and Jess Greer scored all five of her points. Whalen (nine rebounds), her sophomore sister Val (eight points, 13 rebounds), and sophomore Jordan Motley (five points, 10 rebounds) were dominating the paint. Foxboro needed a spark and turned to its shortened bench. Lauren Flahive came in to bank in a jumper and then stepped further back to bank in a three that gave Foxboro a 10-8 lead. After four straight from Stoughton, Sampson buried a three and then found Cassidy Harrison for a jumper to make it 15-14 after one. In the second, Foxboro broke the game wide open. The Warriors forced 16 turnovers in the first half and started to play the game at the frenetic pace that they prefer. Sophomore Grace Tamulionis provided the offensive spark. She knocked down a quick release jumper then followed it with a straightaway three off a Sampson offensive rebound. After Ava Siegel knocked down a shot from deep to cut the lead back to six, Tamulionis quickly answered with another three from the corner. Harrison stepped in to finish off the half with a three and another jumper in transition and Foxboro held a 37-23 lead at the break. 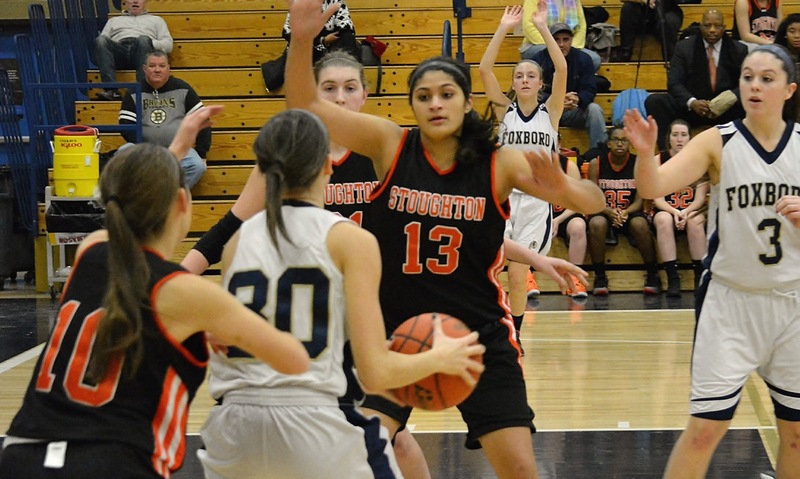 Stoughton was not helped by senior Alecia Quinones picking up two quick fouls and sitting most of the first half. She returned in the third but picked up her fourth foul just 40 seconds after halftime and was limited to just two points for the night. Stoughton scored the first four points of the third, including a layup for Quinones, but then Foxboro answered right back with an 11-0 run. 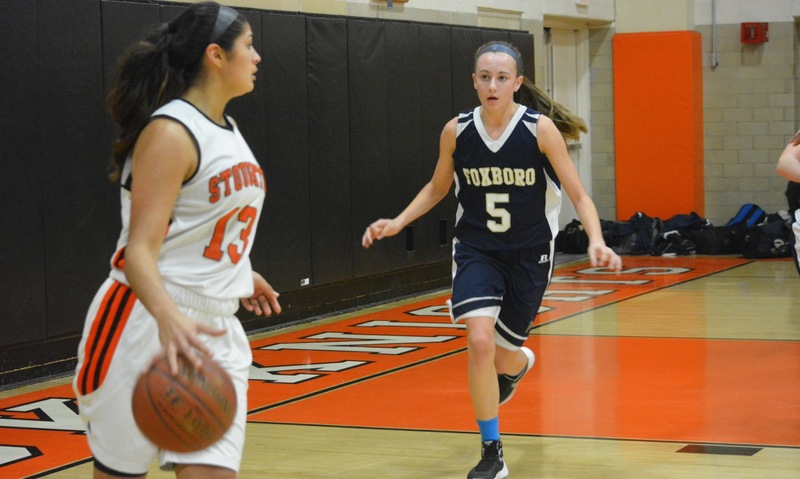 Sophomore Shannon Smally scored all six of her points in the quarter and chipped in with five rebounds, as suddenly Foxboro had the edge in the paint. Foxboro went into the fourth leading 49-29. In the final quarter, the Warriors turned to sophomore Lily Sykes, who scored all six of her points in the fourth and added four assists, and Harrison, who knocked down a pair of jumpers. Flahive also knocked down a jumper to finish with seven points, one of eight Warriors to score on Monday. Julia Foye and GiGi DeNapoli each hit threes in the fourth for the Black Knights, but Stoughton could never get momentum to try and cut the lead. 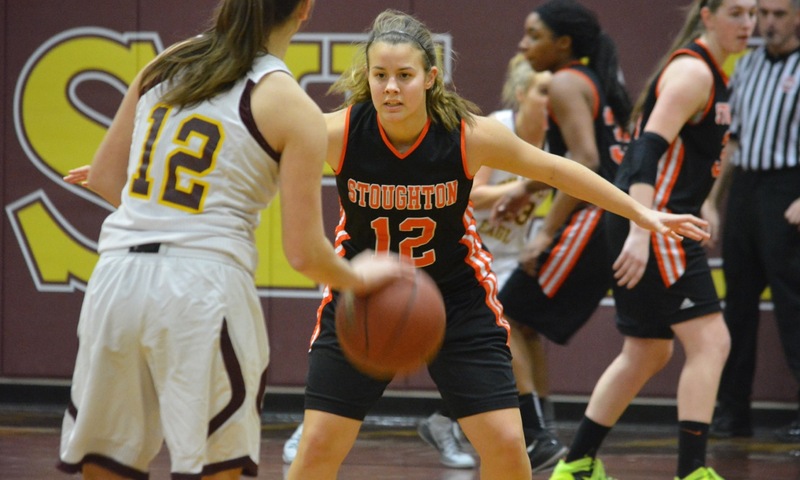 Stoughton (3-1, 3-1) will get a quick turnaround with a non-league game against Fontbonne Academy on Wednesday. Foxboro (4-1, 3-1) will get four days off to prepare for Friday’s meeting with Milford.